with a view deck, in the hills. Each bedroom with a queen size bed. Totally remodeled and refurnished in 2006 in Santa Fe Western style. washer and dryer. Western tiled baths with skylights. Very quiet. Lots of free parking. Indoor pool in clubhouse. Nine minute walk or two minute drive to the Plaza. Our two bedroom two level suite is roughly 1250 sq feet and features an award-winning two story floorplan. It is ideal for two couples to share, or for a small family, with two full bathrooms, one a master bath/bedroom design. The bedrooms are upstairs, large living area downstairs with cable TV with DVD, Wi-Fi internet, and a half-bath, as well. Both bedrooms open to an outside balcony, which takes advantage of the wonderful view. It features a kiva fireplace, a sleeper sofa, a reclining lounger and a rocking chair. 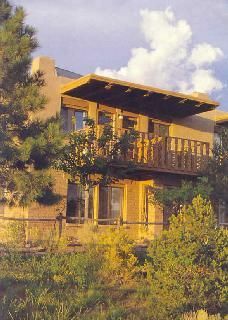 The suite is four to five times as large as the average Santa Fe hotel room - and has a full kitchen, including a dishwasher, stove, microwave, full refrigerator, oven, and place settings for six. One of Fort Marcy's most beautiful townhouses, used as a model by realtors. Two level central A/C and heating Sleeps 4 adults and 2 children Plenty of room for your privacy. Much more cozy than a hotel room. Loved it! Thank you so much. Come again!